Ab Grootjans worked at the University of Groningen between 1975 and 2016 and at the Radboud University Nijmegen between 2007 and 2017. His main field of expertise is eco-hydrology of wetlands. He dealt with projects ranging from eco-hydrological approaches on the landscape scale to very detailed research on the habitat scale. For example, he worked on the restoration of small dune wetlands along the Dutch and German coast and on developing new strategies for a more natural and dynamic coastal development. His work on the restoration of damaged peatlands helped improving restoration activities in various parts of the world including the former GDR, Slovakia, Latvia, Russia, Ireland, Tierra del Fuego, Japan, Australia and South Africa. He has also been active in the Dutch Knowledge network of researchers and managers (OBN) aimed at developing restoration projects in the Netherlands (1990-2015). The area of rewetted peatlands in Europe is still small, but increasing - mainly because agricultural and silvicultural use of many peatland areas is economical less interesting. In many EU countries the continuation of agricultural use in such areas is driven by subsidies. In other words, citizens that do not directly profit from the intensive drainage of wetlands are paying the bills. And the costs of maintaining agricultural use in drained peatlands are increasing due to subsidence of the peat soils. 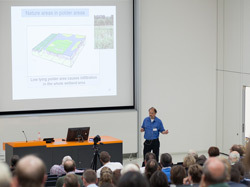 That is why in densely populated areas, such as in the Netherlands, such areas are now used to prevent flooding in cities due to more intensive rain events during summer. The effects of these global change initiated events can be reduced by storing large amounts of surface water in nature areas and in low-lying agricultural areas on peat. This calls for alternative use of such areas. Paludiculture is by far the most sensible thing to do; use these areas wet. However, new investments in infrastructure and in modern equipment to harvest these areas are urgently needed. I propose that money that is now spent on continuing the environmental unfriendly way of land use (subsidies to both farmers and nature protection agencies) has to be transferred to organisations and private companies that are willing to use peatlands in a more sustainable way.